This was a difficult story to get into for me, which surprised me. The premise by Victoria Dougherty seems so good – Czechoslovakia, wartime, fugitive lovers, a faked religious icon, and a plot to assassinate Josef Goebbels – the promise of which kept me reading. But I found the time shifts, the point of view shifts, and the way the action changed from paragraph to paragraph quite confusing. Assuming this was a formatting issue with my Kindle copy, I kept reading. The story starts in Rome in 1956 in the Vatican City with a Cardinal and a man called Felix. Then we see Magdalena and her son Ales in Czechoslovakia, a man arrives and takes away her son. Then the action switched to 1943, as Felix and Magdalena are on the run in Prague. He is a famous hockey player, a celebrity, she is a Jew. By this point, the story should have gripped me but I’m afraid it didn’t, I hadn’t read enough about the two characters to care. I think my basic problem is the way the story was told, not the actual story itself; the writing is rich with description and the author certainly knows her history. Halfway through, things started to make a little more sense though at times the plot seemed unnecessarily complicated. The best bit? The assassination scene, involving a birthday cake, a gun, and Josef Goebbels. 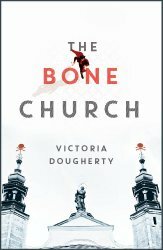 For more about Victoria Dougherty, click here for her blog.